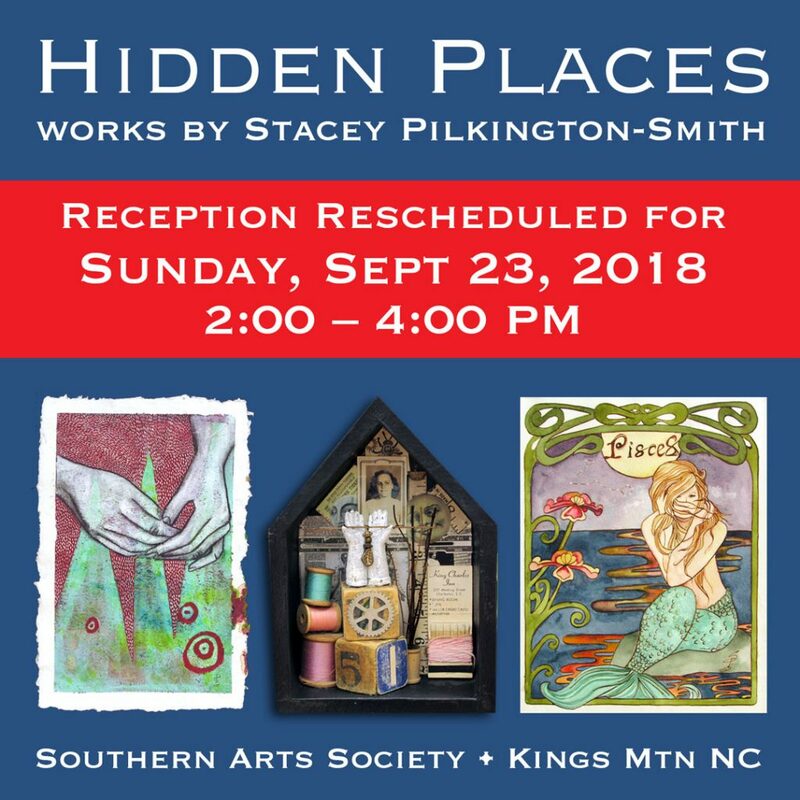 Hidden Places features the works of regional artist Stacey Pilkington-Smith in a solo exhibit at Southern Arts Society thru September 28.Hidden Places harkens us back to our childhood, where whimsy and joy can be found. Entering adulthood, our inner child gets buried under the weight of the world. We stop feeling the warmth of the sun on our faces, wishing on stars, and the grass tickling our bare feet. The intention of the work is to connect the viewers with their own hidden places of bliss. Hopefully you’ll want to stay as long you can in newly discovered places of fresh flowers, giggles, hand holding, and wonder. Stacey Pilkington-Smith works in a wide variety of mediums – watercolor, acrylic, ink and collage; presented in both two and three dimensional forms. She spends most of her time creating her own personal body of work which is inspired from folklore, mythology, and nature. Stacey strives to create art that immerses the viewer in a wonderful atmosphere of enchantment, where viewers can connect with their inner child or remind them of a happy time.The public is invited to meet the artist at a reception Sunday September 16, from 2 until 4 pm at Southern Arts Society in Kings Mountain, NC. Dress is casual.Stacey owns Gallery 27 located in Lincolnton, NC with her husband, Cecil Smith. They share an awesome eight year old human being named Reiland and Mr. Bean, the vicious Dachshund.